Donald Trump Jr. is apparently as 'miserable' as you are during his father's presidency. Dad must be so proud! Two of the children of President Donald Trump, who Photoshops himself onto fake Time magazine covers and has them displayed in his golf clubs, are on the cover of a magazine for real. Good news, boys: Dad's presidency might not last for years! Richard Painter, the chief White House ethics lawyer for President George W. Bush, considers the actions “treason.” “It is betraying your own country in the hands of a foreign adversary,” Painter tells PEOPLE. He notes that under the Bush administration, Don Jr. would have been in custody and brought in for questioning. “I think there are grounds here on campaign finance violations alone that it is illegal,” he says. 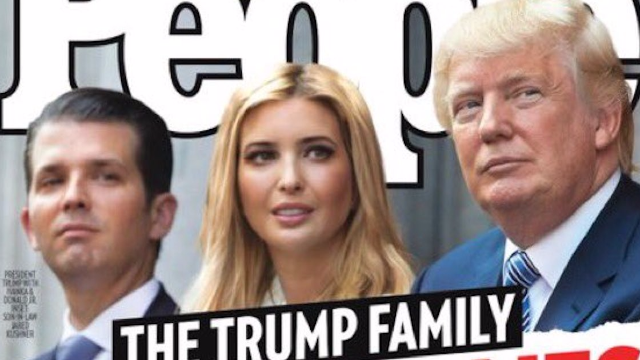 While Junior may be "miserable," he's not miserable enough to change his sheepish devotion to his father. Me, too, Don. Me, too.